Some things are so good you can’t get enough of them. Like coffee. Or Sagrada. More Sagrada will, fortunately, not be a problem in the near future. Floodgate Games have announced not one but three coming expansions for their dice drafting game. The three Great Facades will have modular elements that you can mix into your Sagrada game. Number one, Passion, will be available next spring. We don’t know a release date for Life and Glory, but it’s likely we’ll see at least one more next year. If long, branching, replayable story is what you’re looking for in your next co-op game then you might want to take a look at Tainted Grail on Kickstarter. The dark twist on the Arthurian legend comes with more than 100.000 words of storybook, split into 15 chapters, with a branching storyline and different endings to the whole campaign. The story puts you in a world of Arthurian legend and Celtic mythology that is slowly falling to the Wyrdness. Other heroes have tried to save the world and failed. Players are last ditch heroes, deeply flawed characters who’s problems they’ll have to work around, but who will grow with their adventures, develop skills from a wide range of options, explore this mysterious world and shape history. And don’t think it’s all about beating up monsters, either. Those characters have an Empathy rating for a reason! Legacy games are still the cool thing to do with your existing, successful game series. I certainly won’t object, especially not to Clank! Legacy: Acquisitions Incorporated. Details about the rules are sparse to non-existent, but we know that players will found their own franchise of the legendary adventuring company Acquisitions Inc. and go out to make money, permanently changing their decks and the game board along the way. I’m sure this game is going to make some noise … or would that be a bad thing? The two new heroes from the Guardians – Uprising hero pack in this preview are specialists. Atrivoxx manipulates charge tokens, letting your own hero charge their ultimate abilities faster and slowing down opponents. Nightshade excels at slowing your opponents down. At a location she’s at, and even at neighboring locations, the control token is harder to move in your opponent’s direction. You won’t win locations with Nightshade, but neither will your opponent. When entering someones mind, even for a good cause like waking them from a coma, it’s best to keep a low profile. If their subconsciousness identifies you as an intruder it will try to attack you. That is why in Comanauts each player has three avatars, figures from comatose Dr. Strobal’s imagination they can impersonate. That gives them some protection, but not every avatar fits in every comazone. A talking gorilla in the Wild West is going to raise some subconscious eyebrows. So have a guess if you’ll be able to pick an appropriate avatar wherever you go. That’d be boring, right? I couldn’t find news about this from Space Cowboys themselves, but Asmodee Germany have announced Unlock! Exotic Adventures. The new collection of three escape room puzzle card games takes you places where a regular escape room won’t go. Going by the box cover, one adventure deals with monsters under the bed, another has dinosaurs, and the third is straight out of Arabian Nights. Art is business. That’s not the case since modern times, it was just as true back in the Renaissance. In La Stanza, the new game by Nuno Bizarro Sentieiro and Paulo Soledade (Nippon, Madeira,…), you can be a patron of the arts. You’ll commission artists to do great works for you, but in the end it’s not about the art, it’s about your prestige and wealth. To increase both you’ll also invest in new discoveries and trade routes, build universities and rub shoulders with kings. After all, a real Renaissance Man knows to do everything. Or hires good people, since one main mechanism of La Stanza will be hiring (and firing) characters to help you at the right time. 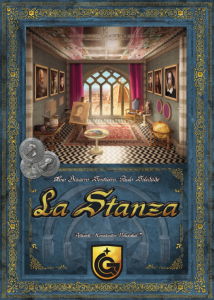 La Stanza will be on Kickstarter in January from Quined Games. Shadi Torbey’s fantastic and surreal Oniverse series of games for one and two players continues. After Onirim and Sylvion the new game will be Aerion. In it, the player(s) are famous air-shipwrights commissioned by the Archonts to build them a new fleet. Six ships are needed to complete the game, and you’ll have to find blueprints, materials and crew for each. From past experience with Oniverse games you probably won’t make it on first try, but with some practice you’ll manage most games. That’s when you add the six included expansions.